There are regular pedometers, and there are smart pedometers. Fitbug’s Air smart pedometer fits somewhere in between the two categories. This “smart” pedometer looks and feels like a regular pedometer—complete with a monochromatic screen and watch battery—but it has a secret weapon that regular pedometers don’t have: Bluetooth 4.0. The Air, which costs between $30 and $60, connects to your mobile device (well, your Bluetooth 4.0-enabled iOS mobile device) to deliver graphs and charts based on your step-data. 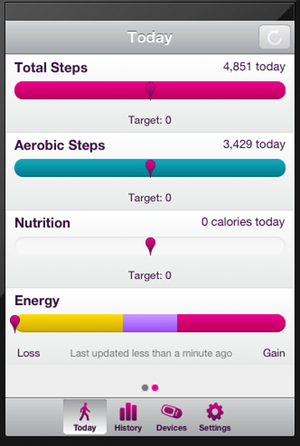 The related Fitbug app, in turn, connects to Fitbug’s website for even more functionality such as nutrition and activity tracking. 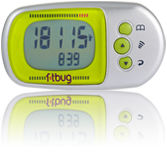 The Fitbug Air is, at its core, just a pedometer. This means it’s a great tool for anyone who wants to track their steps accurately, whether they’re an elderly mall walker or a seasoned athlete. That said, the Air doesn’t really offer advanced tracking (such as heart rate), so fitter users may find this device has limited use for real training. Walking and running are the best activities for the Fitbug Air. The Fitbug Air is an oval-shaped device about the size of a TicTac container. It comes in three color schemes (hot pink, lime green and gray, and plum purple), and has a small monochrome screen and three circular buttons. The top button is the setup button, the middle button lets you cycle through different screens (step count, aerobic step count, calories burned, etc. ), and the bottom button is a memory button which lets you see your last 14 days worth of activity. The buttons also have secondary functions, which we’ll get to later. The Air is powered by a watch battery, which will get you approximately six months of life before it needs to be replaced. Though this initially seems inconvenient, it’s actually quite nice—unlike the Striiv smart pedometer, for example, the Air doesn’t have to be recharged every few days. The Air comes with a thin wristband and a sturdy removable belt clip. The belt clip is convenient for using the Air while working out, but it’s difficult to remove and adds bulk to the otherwise slim device. Getting started with the Air is a bit of a process, though Fitbug does an admirable job of walking you through the steps. My main issue with the setup process is that you're required to setup the device by entering in a straightforward series of settings, such as stride length, weight, and time, then you need to setup an account on Fitbug’s website, and then setup the app on your mobile device—which is a lot of set up for such a simple device. As for the Air itself, this device is strictly a pedometer. It measures the number of steps you take and associated statistics, such as distance walked and calories burned. It does not have a built-in altimeter, which means it cannot measure stairs stepped or mountains climbed. The Air does measure something called “aerobic steps,” which Fitbug defines as any steps taken after you’ve been moving constantly for 10 minutes. In other words, “aerobic steps” can loosely be defined as “exercising steps,” though taking a casual walk would also be considered aerobic (if not strictly exercise). To its credit, as a pedometer the Air is very, very accurate. In my tests, the Air counted steps almost perfectly, even on gym machines such as the stair stepper and the elliptical (though, as I mentioned earlier, it was unable to tell the difference between stairs and regular steps). The Air was off by less than five steps in most of my tests, and was very good at recognizing steps versus non-step movement. For example, during a five-hour drive from San Jose to Los Angeles, the Air incorrectly recorded less than 100 steps—which makes it very accurate in distinguishing between steps and other forms of movement. It should be noted that the Fitbug Air is not a standalone device. 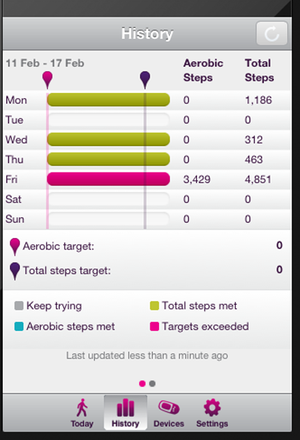 It’s designed to be used in tandem with both Fitbug’s mobile app and Fitbug’s website. And this is where it gets a little complicated—you can’t really just use the Air with the mobile app, you pretty much have to use all three components. First, you’ll need to setup your Fitbug account on Fitbug’s website. To set up this account you’ll need to register your device, using a code supplied on the back of the packaging. Once you’ve registered and signed in, you can start uploading your device’s data to the website—if you download the app on your mobile device. Fitbug’s mobile app is available on iOS, for devices with Bluetooth 4.0 (meaning iPhone 5, latest iPad and iPod Touch, iPad Mini). It’s optimized for the iPhone 5, and uses Bluetooth 4.0 to communicate between devices and sync your data with the cloud. Sadly, it doesn’t look all that great on an iPad or an iPad Mini, but it'll still get the job done. You can decide how you want your data to sync from your Air to your mobile device—you can do it manually (press and hold the middle button on the Air), schedule it to sync at regular intervals (in the setup screen, turn “Beacon” on and choose an interval time), or have it constantly syncing (press and hold the top and bottom buttons on the Air). The constant-syncing option is the nicest, in my opinion, since you can watch your step-count move up from within the app, but it probably uses the most battery life on both devices. The mobile app shows you a little more information than the Air itself does. 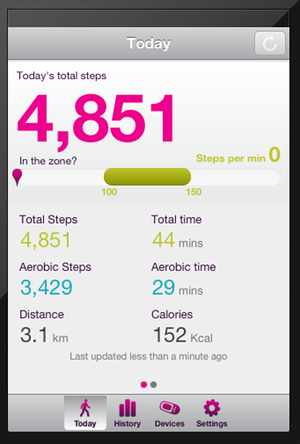 On the main screen, you’ll see your Air data—steps, aerobic steps, distance, time, calories burned. Swipe to the left, and you’ll see whether you’re hitting your goals (which you can set on the website). Tap the “History” tab, and you’ll be able to see your data for any day in the past, as well as information about whether you hit your goals on those days. The nicest feature here is the history tab, which lets you see how you’re doing (and how you’ve done). For the rest of Fitbug’s features, you’ll have to login to the website. The website isn’t free—it costs $3.99/month, ala carte. If you buy the Air for $60, you’ll get 12 months free, and if you buy the Air for $30, you’ll get one month free. Regardless, you'll still need to shell out to access the website and its services to enjoy the full functionality of the Air. On Fitbug’s website, you can track your nutrition, enter in meals (to determine your calorie intake), and take a health assessment test that will spit out preset target goals and allow you to log more detailed activities. The website is really where you’ll be able to monitor attempted weight loss using the Air’s data, though you can obviously do these things (count calories, set daily goals for yourself) on your own, if you don’t feel like paying the fee. The Fitbug Air is a sturdy, accurate pedometer—but that’s really all it is. Unlike other smart pedometers that tie heavily into mobile apps, such as the similarly-priced Striiv Play, the Fitbug Air is fairly limited in what it offers for the price. Unlike the Striiv Play, it doesn’t measure stairs, its mobile app is limited, and its website is subscription-based. Honestly, unless you have a hankering for old-timey displays and watch batteries or a particular attachment to the Fitbug brand, you're likely better off with a device that offers more complete features.